When winter sets, so does the urge to knit. Even after moving to Arizona. My sons, now men, still live in the Northeast and still need warm sweaters (at least in their mother’s opinion). Five winters ago, I started Jack’s Aran Pullover in Men in Knits by Tara Jon Manning. It is just looks sooooo comfortable! About 10″ later, spring came – and then summer with its 100+ degree temperatures. Too hot for knitting. 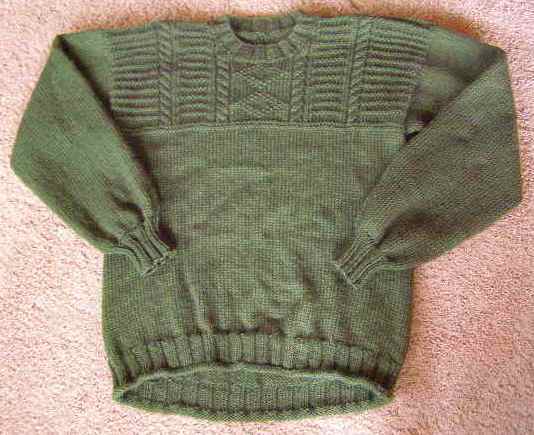 When the temperatures finally cooled off the next winter, a valiant attempted to continue knitting the sweater was made – however, I could not figure out where I was in the intertwined cable pattern. So I put it away for another year….OK, two years. Then The Destashification Project was initiated. Having 20 balls of Alpaca/Cashmere/Silk/Merino yarn in a bag, in the closet, with a partially completed project, would require destashing! 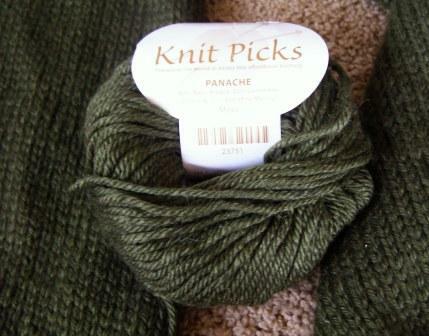 Knit Picks Panache in Moss - Wonderful to touch! The yarn is Knit Picks Panache, which is no longer available, but is WONDERFUL! So I ordered Patons #1232, Inca for Men Booklet from Patons Australia. 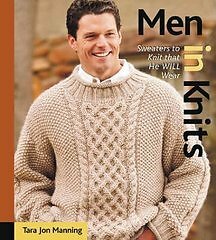 It contained a very straightforward Guernsey Sweater pattern that would be able to hibernate through the Arizona summers. I unraveled down to the ribbing and started knitting whatever number of stitches calculated to 44″ while waiting for the pattern. Summer of the sweater’s 4th year arrived before the pattern. This winter (Year 5), I was determined to finish the sweater! 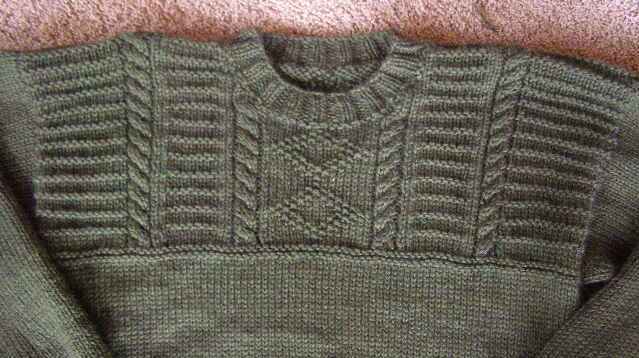 After all the stockinette stitch in the body, the yoke detail was fun – but not long enough for me to lose my place! The “finishing” steps in knitting have always posed a hurdle for me. So to avoid such foolishness as sewing sleeve seams, I picked up the sleeve stitches at the shoulder and knit in the round towards the cuff. Knitting sleeves from the shoulder down also helps determine the correct sleeve length when knitting for a son with a 6′ 8″ arm span! Packaged and insured and mailed off to the son for Christmas. It kept me warm while knitting – and should keep him warm in the frigid temperatures of the Northeast! However, the Destashification Continues! I think I have enough yarn left for a sweater for the size 2 twenty-something daughter. This entry was posted in Knitting, Stash Couture. Bookmark the permalink. Beautiful!! I adore that color. Yes, yes you do. In an even colder/windier place in the Northeast than the boy – where wearing many layers, including a jewel-toned hand knitted lace scarf, is a necessary, albeit futile, effort to ward off the chill! The answer to that question involves a very long list of partially completed knitting. Now that the big sweater is done and on its way, I need to start working through those projects.